Are youth athletes training too much? When is sport specialization appropriate? What are the current research-based recommendations? In this blog post two articles will be reviewed on this controversial topic to help answer questions athletes, parents, coaches, and clinicians ask themselves. Lets first define sport specialization; according to Myer et al. (2015), “Sports specialization is defined as year-round training (greater than eight months per year), choosing a single main sport, and/or quitting all other sports to focus on one sport.” There is a growing concern that young athletes who specialize at an early age may be at an increased risk of overuse injuries, burnout, and possibly dropping out of sports altogether. The goal of this blog is to introduce this topic and make evidence-based recommendations to help guide athletes, parents, coaches, and clinicians to optimize enjoyment and safety for youth sports as well as improve overall long-term athletic development. The degree of sport specialization can vary from low, moderate, and high based on the above definition. Notice there are three components to the definition. If the athlete fell under one of those components he/she was considered low specialization. If the athlete fell under all three of those components he/she was considered high specialization. Statistically speaking, the athletes who fell into the high specialization category had, “2.25x greater odds of sustaining a serious overuse injury,” compared to an unspecialized young athlete. 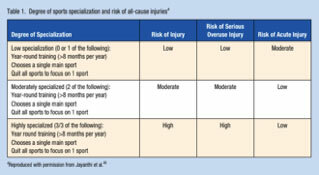 Table 1 depicts the degree of specialization and risk of injury. There is the theory of deliberate practice, which is defined as a “highly structured activity with the explicit goal to improve performance.” This definition is directly related to the ten year/10,000 hour rule. Interesting though, some of the studies that researched this high training volume was based on elite musicians. Looking at the studies of the athlete population, the research says otherwise; early youth specialization may be detrimental in long term athletic development. Of course, there is always an exception to the rule, to name two, gymnastics and figure skating. These athletes appear to do well when they specialize at an earlier adolescence age. Table 2 depicts these recommendations. Another consideration is the psychological risk of burnout and depression these athletes may incur with too early of sport specialization. Often, increased pressures from coaches and family to specialize early on may result in sport participation burnout. A talent development research group on young athletes found “adult-style” or “professionalized” practice is likely not optimal for facilitating talent development. Also, athletes who have less input into their training regimen and sport related decisions practiced fewer days with decreased motivation compared to players who did not burnout. With all this information, there are a few recommendations to conclude this blog post with. • For most sports, specialization should occur at a later age then once thought, we would argue this should take place between 15 and 16 years old or sophomore to junior year of high school. • Regardless of age, athletes should take at least one season off per year / not play a specific sport >8 months. • Hours of organized sport activity per week is recommended to not exceed the athletes age. • At max an athlete should not exceed 16 hours per week of organized sport. • Organized sport should be fun and enjoyable for the athlete, they should have input into their sport related decisions. • Strength Training is safe for these young athletes. (Hint for next blog post). If you know an athlete struggling with an overuse injury, and you are wondering how we can help them get back to the sport he/she loves, here is the link to our contact information. Please call and ask for one of our physical therapists for a free phone consultation. We are conveniently located at the southeast corner of Mackay Stadium.